According to *Constructionweekonline news report, the China Pavilion at Expo 2020 Dubai has been designed with inspiration drawn from the traditional, now-iconic Chinese lantern, with the structure to be named 'The Light of China'. China Council for the Promotion of International Trade made the design announcement on 2 April, as reported by China-based English news outlet China Plus. China's 500m Aperture Spherical Telescope, also called Fast; the Beidou Navigation Satellite System; and 5G technology are reportedly set to make their debut at the next World Expo, which will open its doors in Dubai on 20 October, 2020. The theme of the China Pavilion is 'Constructing the Community of Human Destiny – Innovation and Opportunity', and the structure will showcase the Asian superpower’s achievements in the field of information, science and technology, education, and communications. China Pavilion’s appearance will reportedly highlight ancient China’s four great inventions – papermaking, compass, gunpowder, and movable-type printing. It will also be decorated with glass and Chinese traditional lattice windows. The news comes amid a string of Expo 2020 Dubai- related pavilion announcements. Spain revealed its Expo 2020 presence in the UAE megaproject’s Sustainability District in February 2019, with its pavilion focusing in particular on tolerance and Spain’s “interwoven history with the Arab world”. 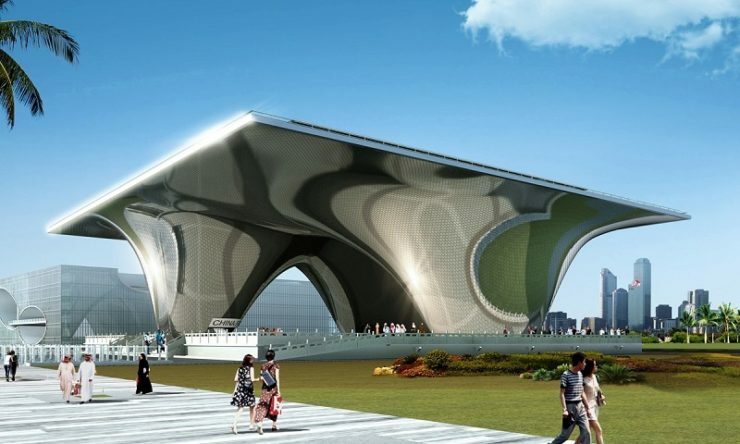 South Korea’s music, travel, Fourth Industrial Revolution (Industry 4.0) ambitions, and pop culture will be highlighted through its ‘continuously changing’ country pavilion, as revealed in the same month.